Blair Somerville is the resident ‘organic mechanic’ and creator of The Lost Gypsy Gallery (free entry), and The Winding Thoughts Theatre of Sorts ($5 entry – R13). If you like unusual attractions definitely pull over in Papatowhai, your time and money are well spent here. 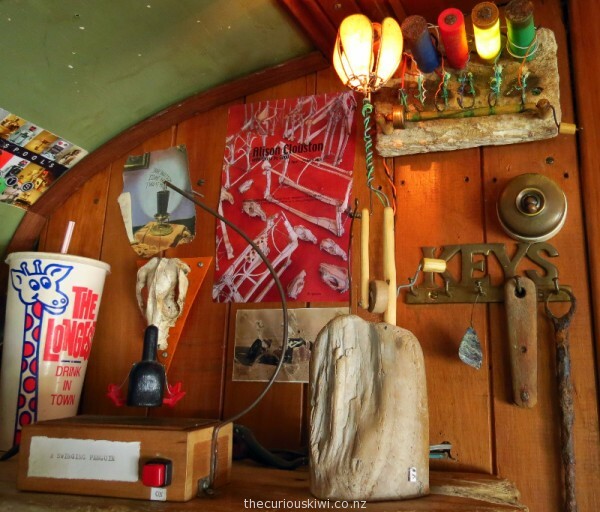 The Lost Gypsy Gallery is in a big green bus and it is full of unusual little wonders made from bits and pieces gathered at the nearby beach, and anything and everything old and unwanted. 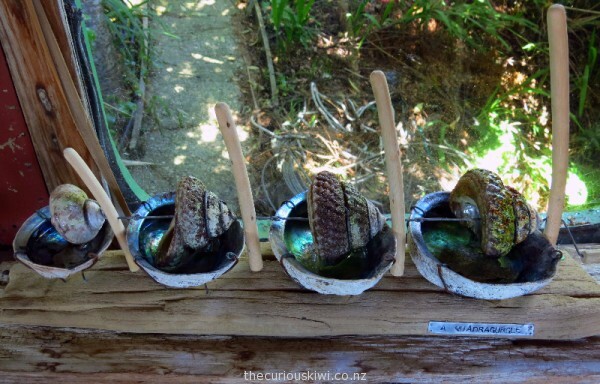 One of my favourite creations is ‘A Quadragurgle’ – a water feature made of shells and driftwood that you wind gently to circulate the water. Another was a metal flower that lights up when you wind the petals closed. The Winding Thoughts Theatre of Sorts ($5 entry for over 13’s only) is the space for Blair’s larger inventions. 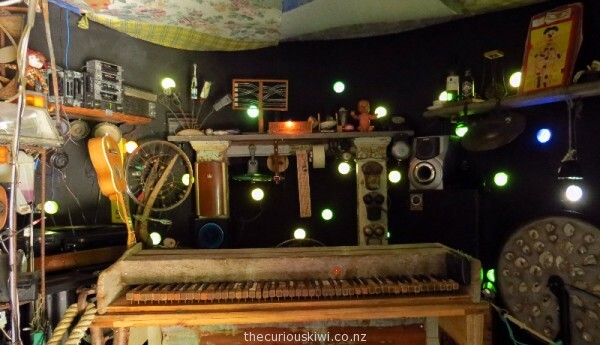 You can sit under an old fashioned hair dryer and listen to the sounds of the kakapo; and play a piano that has keys wired to a ringing dreadlock wig, an electric toothbrush, and car radios. 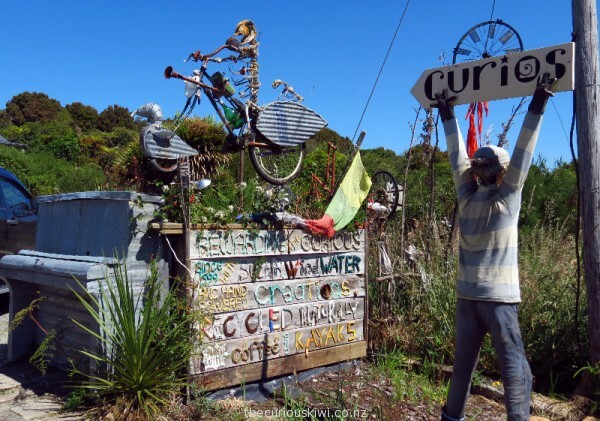 Welcome to the curious corner of the Catlins. 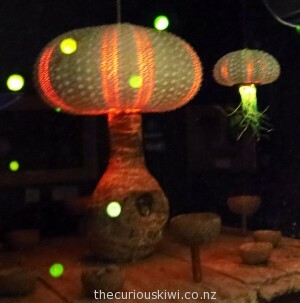 You’ll see that kina shells can be lit up to look like pretty miniature light fittings, and who knew that a screw driver moving over the spokes of a bicycle wheel attached to a metal bowl could sound so beautiful. Different sounds come from the toilet, not so beautiful sounds at first, but the laughter that usually follows makes up for it. Enter Blair’s world, take your time, and wind gently, you are sure to be surprised and delighted. The Lost Gypsy Gallery is *closed Wednesdays all year, and closed over winter, exact dates unknown. The unusual creations don’t end in the galleries, sitting alongside is The Little Rocket coffee caravan. 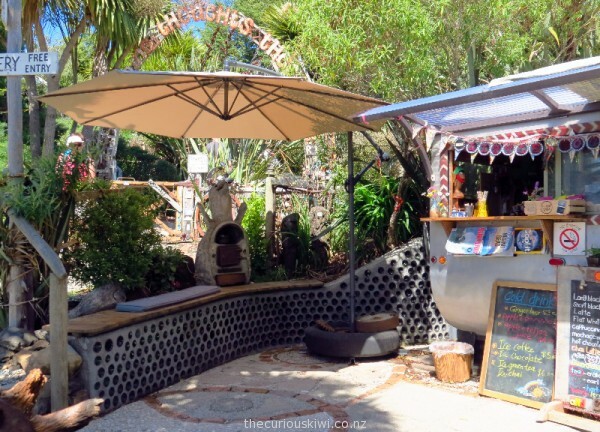 There is a neat mosaic seating area that incorporates some unexpected but effective mosaic materials – car tail lights and indicators; nice coffee too. 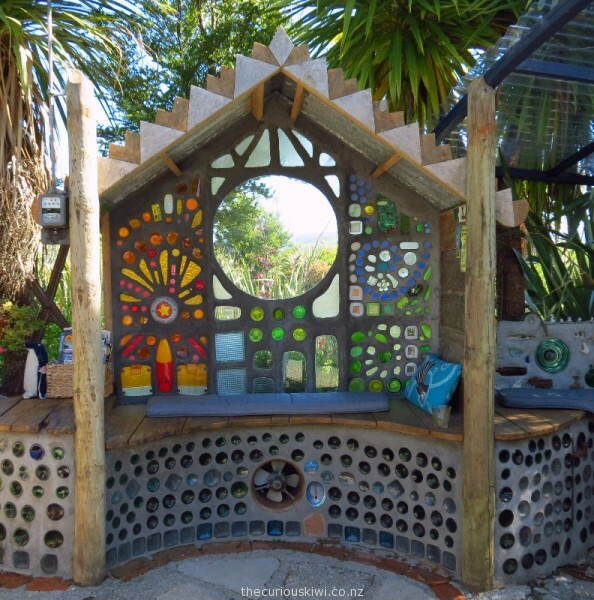 This entry was posted in Southland, Twelve Dollar Attractions, Unusual New Zealand and tagged The Catlins, The Lost Gypsy Gallery, The Winding Thoughts Theatre Of Sorts by thecuriouskiwi. Bookmark the permalink.